Last night, my friend Sharon and I went out for dinner at Muzita Bistro, a self-styled Abyssinian restaurant in University Heights. 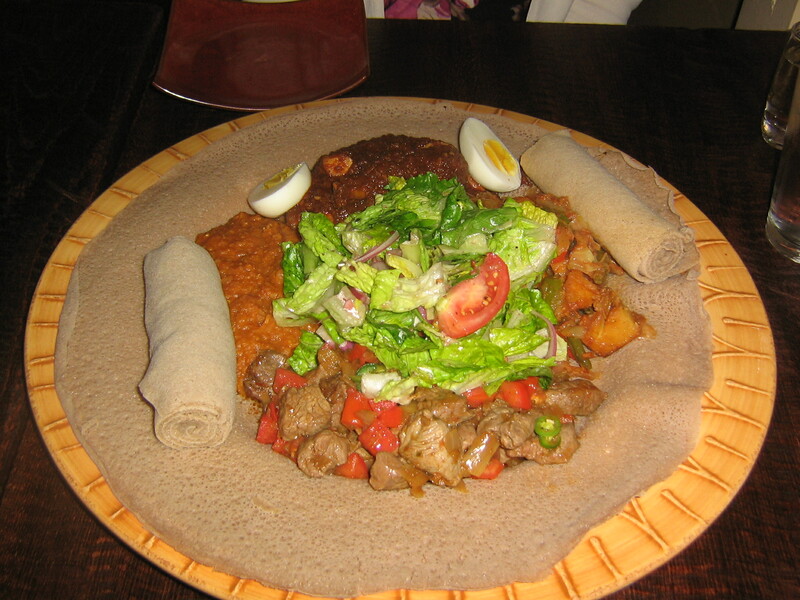 The food is very similar to Ethiopian cuisine. There are several Ethiopian restaurants in San Diego, such as Harar, but Muzita is definitely several steps up from them. The food is excellent and the decor is modern, but comfortable. The owner, Abel, has the unusual gift of talking to anyone and showing interest in what they say. However, he matches his friendliness with an efficiency in taking care of his customers, periodically checking on them to see if there’s anything they need. Sharon and I went a family style plate where we shared two entrees, two sides, and a salad all on a bed of injera (pictured above). Two stews served as our entrees, Tshebi Dhoro (the chicken one with the eggs) and the Beggie Kilwa (with lamb) and the sides consisted of lentils and some spicy vegetables. All of it was very good and we got full quickly, especially with roll after roll of injera to scoop it up. Regarding drinks, Muzita offers Ethiopian beers and wine, and some soju cocktails for a small fusion touch. 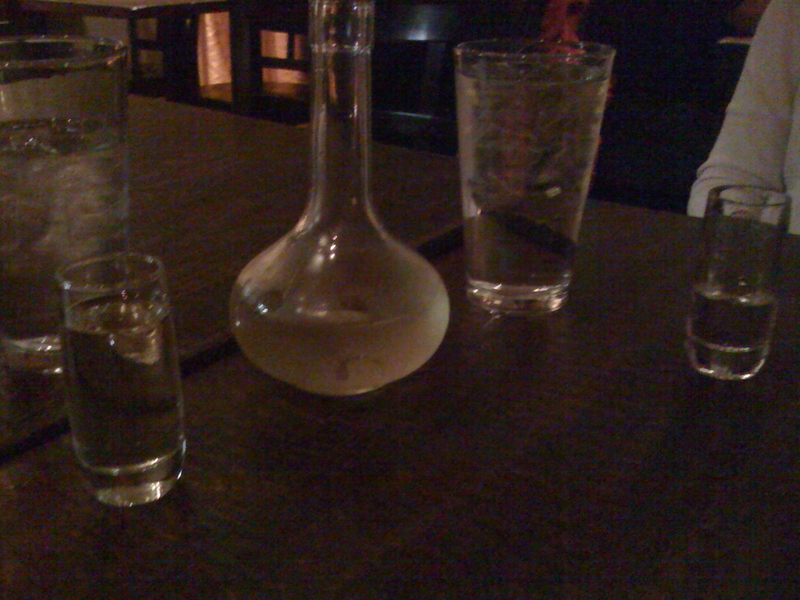 Sharon and I decided to try the honey wine and it was very good, and it complimented the food like the server promised. When Sharon asked if the server knew how the wine was made, she replied the owner keeps that a secret. Abel’s worked hard to get this place right, so he’s entitled to some trade secrets. Sharon and I made a toast to friendship, as we’ve known each other for eight years. I met her along with her boyfiend Brian when I was in graduate school and I count them as a couple of my closest friends. We also have a few mutual friends, such as Nadia, whom we met in our graduate programs. Sharon and I also made a toast to surviving the Bu$h era. Our graduate school careers (and those of our mutual friends) took place largely in the Bu$h era, and even our lives afterwards had that shadow over them. That era was over and we also made a toast to the new era of Obama. No visit to the restaurant is complete without me taking pictures. I’ve taken pictures of the food and the drink. I’ve taken a few more and Sharon took one of me, but I also played around with the salt and pepper shakers and the candle. I’ve put more of the pics up on Facebook. I would definitely make a return visit. The price is $$, but worth it. Great post–sounds like a cool restaurant. 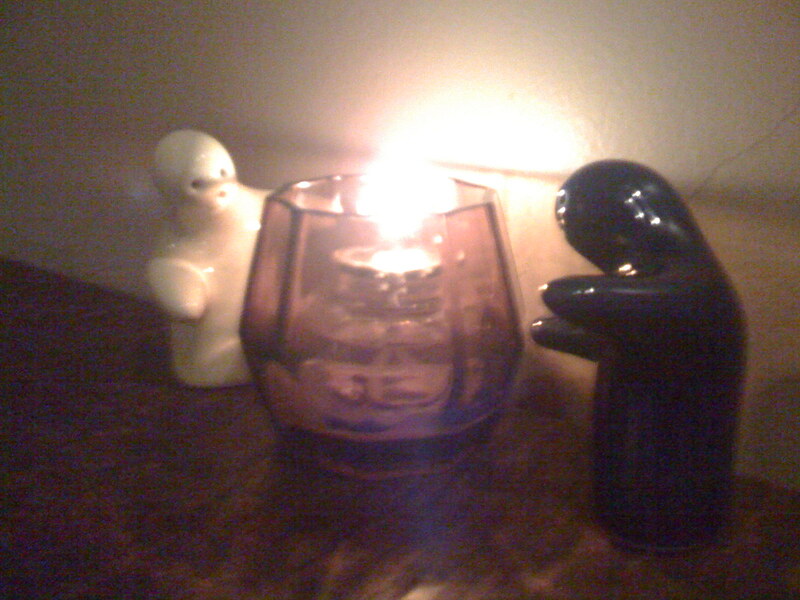 One thing: those are the most adorable salt & pepper shakers ever! Thanks, Shooter, for the link! I enjoyed that vid and it also helped show a little bit about why the food is good. Plus, Abel is wonderful about explaining his restaurant.